Dear followers and sympathisers of edgy urban genres, it is my pleasure to present the first edition of new platform Syndicate that reflects the unstable conditions of our space also through its variable name. The name of this edition “Syndicate of Outlandish Entities” will (self)destruct until next year and a new Syndicate will be formed according to the socio-political conditions of the time. In first year we are mostly focusing on edgy urban genres with elements of cabaret, new burlesque, grotesque, irony and satire. We selected especially shows that approach their contents in a direct, ironic, subversive and engaged way. Selected shows exceed established genre and frequently also conceptual frames, avoid using populist cliches and sexist, chauvinist or xenophobic statements. We mostly present local creators, selection is supplemented with some interesting international guests and two workshops for current and future stars of local cabaret, a lecture, talk session, round table discussion, photo exhibition and clubbing. Programme will take place in six evenings at different venues of AKC Metelkova mesto and in the Španski Borci Centre. The decision for Metelkova is not random, as this autonomous centre has hosted many representatives of these genres under its roof in its abundant, 25 year-long history due to the chronic shortage of appropriate club/stage venues in Ljubljana. As the platform was established in scarce financial and production conditions, we are presenting finished shows that are, due to their fluid nature, seeming as »a paradox of efficient recycling where the known gets a different vibe and where one searches for and expects the pleasure of repetition”.1 In the flood of new productions and festivals and the declining options for re-runs and touring in the non-governmental art sector we consciously decided it is time to recycle! The expression “edgy urban genres” also contains a dose of irony as the production strategies that are usual in “little arts”2 are lately becoming the modus operandi also in all other areas of contemporary creative practices. Unlike the capitals of the West, where the value of genres of “little arts” is recognised within cultural politics, tourism and economy for decades already, our decision makers still fail to see their (sufficient) artistic value. This platform is intended for raising awareness of this growing field of urban genres, we want to caution the decision makers to recognise their existence, potential and the growing popularity which should be reflected also in providing stable working conditions (including space-related), public co-financing of such programmes and securing conditions for professionalisation of actors in the field. The scheduling, financial and organisational-logistic problems in preparing this pilot edition are the reason for the exceptional overlapping of our programme with Mladi levi festival this year. Both festivals are sufficiently unique and compatible to address different publics. Syndicate has a more narrow genre profile as Mladi levi and is also more locally focused. We admit this year’s solution is not ideal but we still announce the collegial cohabitation with Mladi levi festival, for which we are eternally grateful! 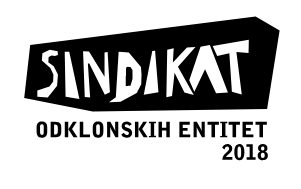 Syndicate is and initiative by Emanat Institute, dedicated to promoting contemporary dance and performance from establishment in 2007. Besides stage shows, publishing and educational activities we are also developing the genres of new burlesque, cabaret and contemporary performance with own cycle Image Snatchers and in collaboration with different NGO actors and venues we are for several years organising quality and well-accepted workshops for local creators, devised by internationally acclaimed creators in the genres. All locals, foreigners, random visitors, tourists, experts, selectors, financiers of culture, tourism promoters and managers of venues and larger clubs are invited to many experiences we selected especially for you. You can expect significant fun, laughter, audacity, provocations and other bitter-sweet pleasures, this time mostly on smaller club stages. 1 Zala Dobovšek, “Tehnoburleska Tatovi podob: Paradoks učinkovite reciklaže in nujnost osvobajanja teles, (The Paradox of Efficient Recycling and the Necessity of Liberation of the Bodies), Dialogi, 2018. 2 German expression Kleinkunst (little arts) describes types of theatre that include cabaret, burlesque, improvised shows, stand-up comedy, revue, etc. Shows and acts are mostly presented in smaller or club venues that are primarily not intended for stage productions, they also require limited production resources. Such shows enable a more intimate public atmosphere that can follow the performance from up-close and frequently actively participate in it. We recycle on all levels but it’s not enough!